How would you like to have a little brain atrophy? Atrophy is a term that means a shrinkage of tissue. So brain atrophy means that the brain is shrinking. Now that just doesn't sound like a good thing. And it isn't. Brain atrophy leads to cognitive impairment and Alzheimer's. Nevertheless it's not all that abnormal in the over-60 crowd. Whenever I need to order a brain scan in an older person, it's not that uncommon at all that the report comes back saying the patient "has the normal age-related brain atrophy." What? Normal brain atrophy! I don't much like being that normal. So is there anything you can do to prevent getting this common problem? Just last month, researchers reported on a study of 168 men and women 70 years old and older who all had mild cognitive impairment. The researchers performed MRI scans of their brains to determine how much brain atrophy they had. In addition, they also measured their blood levels of EPA and DHA (eicosapentaenoic acid and docosahexaenoic acid). 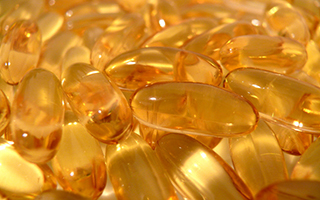 As you probably already know, EPA and DHA are the therapeutic oils found in fish oil. Then the researchers gave half of them a vitamin B supplement containing folic acid, vitamin B-6, and vitamin B-12. The other half got the placebo pill. Two years later, they re-measured all the tests. The results were both amazing and interesting. The people with the highest levels of EPA and DHA who got the B-vitamins slowed down their rate of brain atrophy by 40%. But those with the lower levels of EPA and DHA saw no benefit at all from the B-vitamins. Why is this? Apparently, there's an interaction between the fish oils and the B-vitamins such that the brain is not able to use the B-vitamins effectively when there isn't enough of the fish oil around. But this leads to two questions. First, why did the patients with the higher EPA and DHA levels respond so well to B-vitamins in the first place? In all likelihood it's because they were deficient in them. Herman Baker, PhD showed years ago that 30% of everyone over the age of 60 is deficient in at least one B-vitamin. Why? It's because as we get older our ability to digest and process B-vitamins becomes impaired. The good news is that you can easily overcome this problem just by taking a B-vitamin supplement. Over the years, I have learned that of all the nutritional supplements out there, the ones with the most marked effect on older people are the B-vitamins. That is exactly why I load up my Super Immune QuickStart powder with such high doses. Second, what was the reason that so many of the patients had such low levels of EPA and DHA? It's because unless you are eating a lot of fish or taking fish oil supplements, you have to depend on your body to convert the parent oils in foods into EPA and DHA. And many people just can't do that conversion very well. For them, the only way to have optimal levels of EPA and DHA in their brains is to either eat a lot of fish or take fish oil supplements. And keep in mind that DHA is the major fatty acid in the brain. You must have adequate levels of DHA for good brain function. And one last thought. The researchers point out that "the beneficial effect of DHA and EPA on brain atrophy may be confined to subjects with good B-vitamin status." In other words, taking all the fish oil in the world will not help your brain function unless you are already sufficient with your B-vitamins. So if you are in the I'd-rather-not-have-brain-atrophy crowd, you can reduce your chances by 40% just by taking B-vitamins in conjunction with EPA and DHA. For me the easiest way to do that is to take one to two scoops of Super Immune QuickStart along with two Complete Daily Oils capsules every day. Jernerén F, Elshorbagy AK, Oulhaj A, et al. Brain atrophy in cognitively impaired elderly: the importance of long-chain 3 fatty acids and B vitamin status in a randomized controlled trial. Am J Clin Nutr. 2015 Apr 15.